A distributor of Bean and Ford vintage motor-cars in Carlisle. Homepage. This page: An illustrated letter from a motor-car dealer based in Carlisle, dating to the 1920s. James Hodgson - Ford & Bean automobile sales. 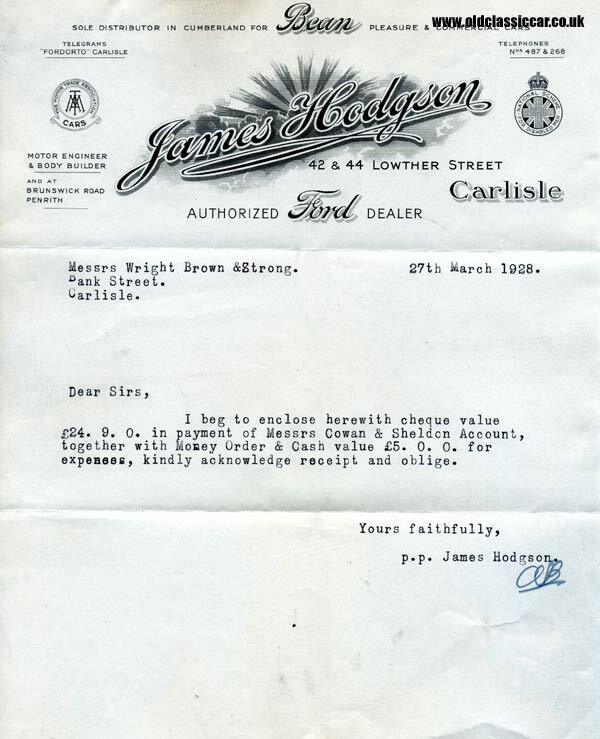 This letter relates to James Hodgson, of 42 & 44 Lowther Street, Carlisle, a motor engineer and dealer based in that area. He was a member of both the MTA (Motor Trade Association) and the National Scheme for Disabled Men, both being organisations that feature on other, similar, items of paperwork to feature in this section of the website. Interestingly, not only was he an authorized Ford car dealer, he was also the sole distributor for Bean "Pleasure and Commercial Cars" in Cumberland. He could be contacted in person, at his Lowther Street address, or by telephone (two lines available), or else by telegram to "Fordorto" Carlisle. There is also mention of further premises located at Brunswick Road in Penrith. The letter refers to a cheque payment sent to solicitors Messrs Wright Brown and Strong, of Bank Street in Carlisle, by motor engineer James Hodgson. A check of Lowther Street today no longer finds a garage or in fact anything relating to the motor trade at this address. Number 42 Lowther Street is now an Argos store, while Number 44 appears to be a beauty products shop. The former building looks to have been re-developed since the era of this letter, however Number 44 still shows evidence of once being a motor-car garage or dealership of the vintage era. Bean motor-car were produced from 1919 to 1929, although by 1928 their products were known as Hadfield Beans. Time was running out though for the Dudley-based motor manufacturer by the time of the letter shown above, from 1929 the firm would concentrate on building commercial vehicles rather than motor-cars, although by 1931 sales were dipping and the decision was taken to end vehicle production, the firm continuing to produce components rather than complete cars and trucks. 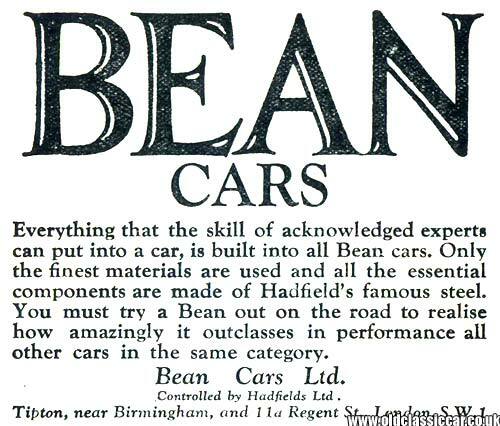 The advertisement below for Bean motor-cars is contemporary to the letter shown above. Return to the motoring collectables section for other similar items. Another old invoice, relating to Fields Garages Ltd of Chichester, refers to maintenance work undertaken on a Bean motor-car in 1923.